A gorgeous Calla Lily Bridal Bouquet made in less than fifteen minutes. Bridal Bouquet. Why silk you may ask? 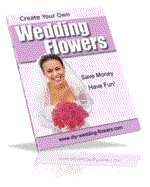 I scouted out several flower shops, but I found the prices way out of our wedding budget price range. We decided on a Calla Lily Bridal Bouquet. I found some very real looking ones in a craft store. This ended up to be the best thing ever. They actually had a lot of the materials that I needed for my outdoor wedding flowers and decorations. I didn't have to worry about them wilting, and it was so much fun to make. * For this project you will need 12 white silk calla lilies. *A nice one and a half to two inch wide velvet ribbon about three feet in length. It can be white if you want a neutral color that matches anything. I used a royal purple because that's what the color of my daughter's wedding. Now for the assembly of this bouquet. Place one flower on the table with a fern branch underneath. Then place the next flower beside the first one, but pull it down just a little lower. Place another fern under the second flower. The ferns should stick past each flower just a bit. The next set of flowers should be about three wide, placed just a little lower than the second one. You sort of create an elongated upside down V shape with the flowers. Now as you place each flower, the stem area will grow longer. After the flowers and ferns are all in place, grab them altogether by the stems, like you're holding a bouquet, but making sure that it keeps it's shape. Then take your ribbon and tie it about ten inches down the stems. Work your way up the stems winding the ribbon criss cross up towards the flowers about ten inches, and tie a bow leaving about six inch long tails. Now trim the stems just below the end of the wrapped ribbon. The glue gun works great to attach the ribbon as it's wrapped around the stems. WA LA you now have a gorgeous silk calla lily Bridal Bouquet. I've included 2 videos for more illustration. Was the information on this page helpful to you? Please let me know I'd love to hear form you.